No goals -- In a collegial law firm environment where equity shareholders are owners, establishing goals is akin to playing favorites among equals, so management avoids establishing practice group goals and instead relies on broad organizational goals. This approach generates numerous problems. When we don't know which group is generating the most profit, we tend to allocate resources haphazardly and randomly, thereby diluting the investment in high-growth areas and over-loading investment in weak performers. We also perpetuate subsidies of weak groups by strong groups, and while the organizational ledger may not explicitly reflect who's subsidizing whom, everyone generally knows and some are not happy about it. We also fail to take corrective action when a group that could be performing well isn't, because its poor performance is masked within the larger firm results. Stretch goals -- These are goals that go well beyond the previous high water mark of achievement, without a specific plan for attaining them. Nothing wrong with stretching, of course, and countless athletes have thanked their coaches for pushing them beyond their known limits to achieve superior performance. But simply demanding significantly higher performance without providing additional support or guidance sends a message that prior performance is considered lazy. In fact, this might be lazy management. "Work smarter, not harder," the manager says, as if these words alone will unlock efficiencies. A stretch goal works when there is a corresponding plan in place to break through previous barriers. Equalized goals -- When management has an unsophisticated understanding of the market and the organization's capabilities, it establishes the same goals across the board. Every group must achieve 5% revenue growth, or every group must cut costs by 10%, or every group must improve profits by 8%. 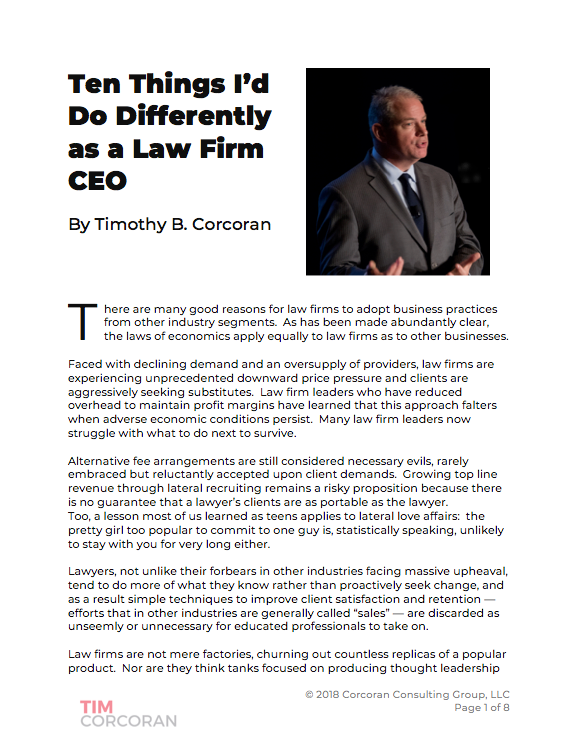 It would be an extraordinarily unlikely occurrence in any multi-line business, and most law firms are quite diverse in their practice offerings, for all units to have the exact same opportunity within a specific fiscal year to achieve similar results. Establishing the same goals for all units is formulaic, and the lazy managers who rely on this approach can literally be replaced by spreadsheets. So that's what not to do. What should we do? We can only answer this by having a deep understanding of both our internal capabilities and the external business climate. It could very well be folly to establish a revenue growth goal of 20% in a market where the most successful competitor is growing at 8-10%. It could similarly be folly to expect profit improvement of 5% from a group that is top heavy (i.e., over-staffed by partners) and therefore poor leverage and rate pressures are likely to depress earnings. So for each group we must examine the market opportunity and the competitive landscape to establish a baseline, and then we must examine our internal capabilities and practice group characteristics to establish our desired performance relative to this baseline. This approach will very likely produce different goals for different practices, as no two markets share the exact same dynamics. Each practice group should have its own particular analysis informing the goals, and a narrative explaining the rationale and short- and long-term impact of any investments. Let's walk through a couple very simple examples illustrating the benefits of marrying internal and external analysis to derive informed goals. We'll rely merely on narrative rather than spreadsheets here, for expediency. The IP practice group has a modest revenue CAGR of 8%. However, its 82% realization rate is lower than the 89% firm average, and the group's contribution margin at 21% is lower than the firm's 31% overall profit margin. Through competitive analysis we've determined that one of our key competitors is adding staff and winning new clients at a much higher rate, in part because of lower rates. While we can't discern the competitor's IP group profit margin, we have observed overall firm profits to be up significantly. We've determined that our competitor's low rates aren't "suicide pricing" but in fact reflect an investment in process improvement and project management. Through sources we've learned that they rely increasingly on fixed fees. We invest in a process improvement and project management initiative, which in its first year will further burden our profit margin, but will bear fruit in year two and beyond. We set a goal to increase our realization rate to 85% by identifying which matter types and/or tasks are subject to the most client scrutiny and prioritizing these areas for improving efficiency. We modestly increase our revenue goal to 9%, reflecting our confidence that our efficiency initiative will stop the attrition of clients and generate new matters. To secure this future, we'll kick off a client satisfaction tour conducted by our CMO and managing partner for our top clients, and launch an end-of-matter satisfaction survey for every closed file. We will hold our contribution margin goal at 21%, reflecting the incremental investment in the above initiatives offset in part by a freeze in hiring -- given our expected efficiencies we believe we're properly staffed. But we don't stop there. We set preliminary 2- and 5-year goals for revenue and profit to reflect the ongoing benefits from this year's investments and we link our practice group leader's bonus to shepherding and achieving these goals. The Litigation practice group has enjoyed superior performance in recent years, subsidizing other groups with its above-average revenue and profit margin, but this is in large part due to a significant matter that is expected to conclude in the first quarter. The 18% year over year revenue for the last two years is certain to decline, and the high staffing levels related to the large matter will depress profits from the current 38% margin until these resources can be redeployed. The concluding matter is being watched by numerous other players in the market, and a wave of similar litigation is expected in numerous jurisdictions. The lead partner has been asked to speak at an industry conference on the topic, and we've designed an all-out market blitz to capitalize on the notoriety. An integrated campaign of traditional and social media, including a new blog, has commenced, and all partners and most senior associates have a visible role to play. We expect by year end to have enrolled multiple new clients, though the billings won't be sizable until the following year. We've identified numerous other areas of litigation that provide excellent training opportunities for our numerous young associates, and we've made assignments, particularly to matters with alternative fee arrangements in place so the client won't object to additional timekeepers participating. Our utilization will remain high as these associates will be kept busy, but there is minimal incremental revenue associated with this time. We relied heavily on contract attorneys for some of the nuts and bolts of the complex litigation so that cost will disappear almost immediately, with the exception of a few stars we expect to hire full time. The net impact of these efforts results in a revenue goal of 9% over the current year and a profit margin goal of 32%. The Corporate practice group has enjoyed a 11% revenue CAGR in recent years and its healthy 28% profit margin allowed us to recently invest in several key lateral hires. These laterals are expected to import several new clients and present additional cross-sell opportunities beyond the healthy rate at which the Corporate group already collaborates across the firm. We tend to be very cautious when recruiting laterals, eschewing "elephant hunting" for more strategic and targeted wins. As a result, each of our several lateral recruits has a confirmed revenue base to bring in, and our due diligence up front confirms that we can integrate these practices within the Corporate group to improve margins, as many of our under-utilized resources and existing technology can be deployed immediately to serve the new clients. The external market for the transactional areas in which we excel and which we have recently invested are booming, and while client fee pressure is expected down the road at the moment we are enjoying premium rates for most services. We therefore establish a revenue goal at 22% over the current year, including the lateral business, and an improved profit margin of 32%. These examples are, by nature, simple narratives that overlook a significant amount of underlying complexity. However, the central point is that each practice has different external and internal characteristics that require different approaches and different objectives. Setting goals that are equal across the board would be patently unfair and would muddy the waters when analyzing performance. Setting goals that are unrealistic would be risky, particularly if a short-term dip in performance would significantly impair a partner's individual compensation and lead him or her to depart with a book of clients. And avoiding the establishment of practice-specific goals would likely result in starving the groups most in need of investment. Don't fall into the habits of lazy managers and establish weak goals. Do the work and establish realistic, informed goals. Your organization and your shareholders deserve nothing less.